One by One Lashes. The individual lashes are lightweight and have the advantage of staying on longer. It is easy to create the desired natural effect by looking at the curl and length of lash that suits your customer. These synthetic individual eyelashes can not be distinguished from real eyelashes. The individual lashes are lightweight and have the advantage of staying on longer. It is easy to create the desired natural effect by looking at the curl and length of lash that suits your customer. The individual lashes are available in different lengths, thicknesses and curl types. The length and thickness of the individual eyelash is determined per individual. Take great care when choosing the individual lashes, to avoid natural lashes from breaking. 8 mm: short -inner corner/ outer corner of the eye. 10 mm: medium - building up the inner corner/ outer corner of the eye. 12 mm: medium - creating length in the middle of the eye. 14 mm: long - creating length in the middle of the eye. This lash shape is perfect for people with straight lashes, who want to create a natural look with more volume. The J-curl can also be used as a One by One eyelash extension for the lower lashes. This lash shape is perfect for people with a slight curl in their lashes. These lashes are mainly used for a natural round curl. This lash shape is perfect for people with straight or curly lashes. These lashes have the most extreme curl. This lash shape is perfect for people with straight or curly lashes. These lashes are not suitable for people who have deeply imbedded eyes. An assortment package is available: curl is in different thicknesses and lengths. Pick two JACKY M. tweezers of your choice. Make sure that all of your equipment is within hand’s reach. 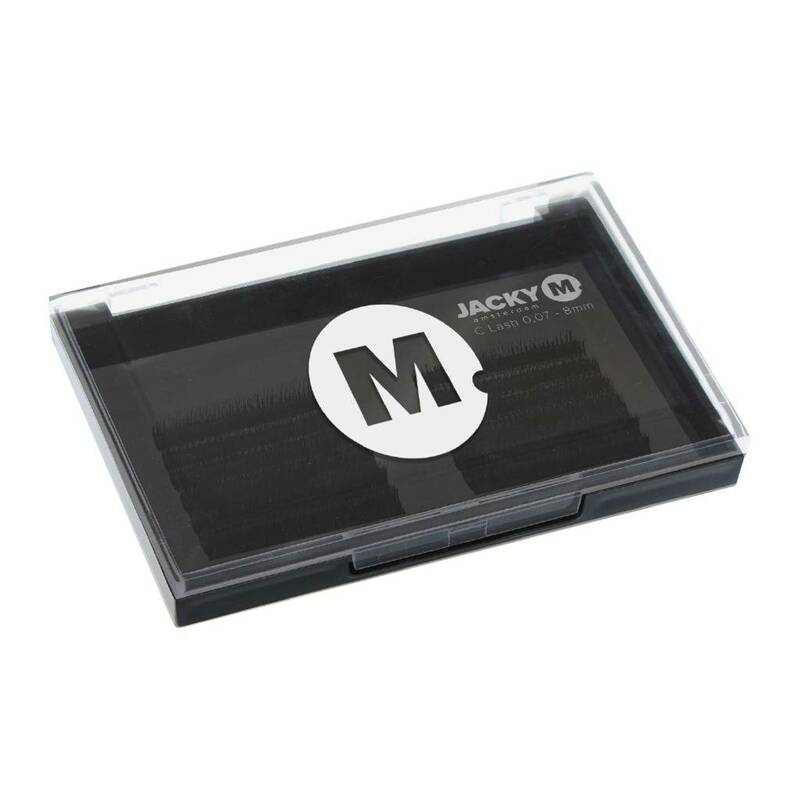 Place a drop of JACKY M. adhesive onto the glue sticker which is attached to the glass plate. Use two tweezers for the treatment. Use one to spread the lashes and the other to pick up the required lash extension. Dip the lash extension into the Adhesive before applying them onto natural eyelashes. 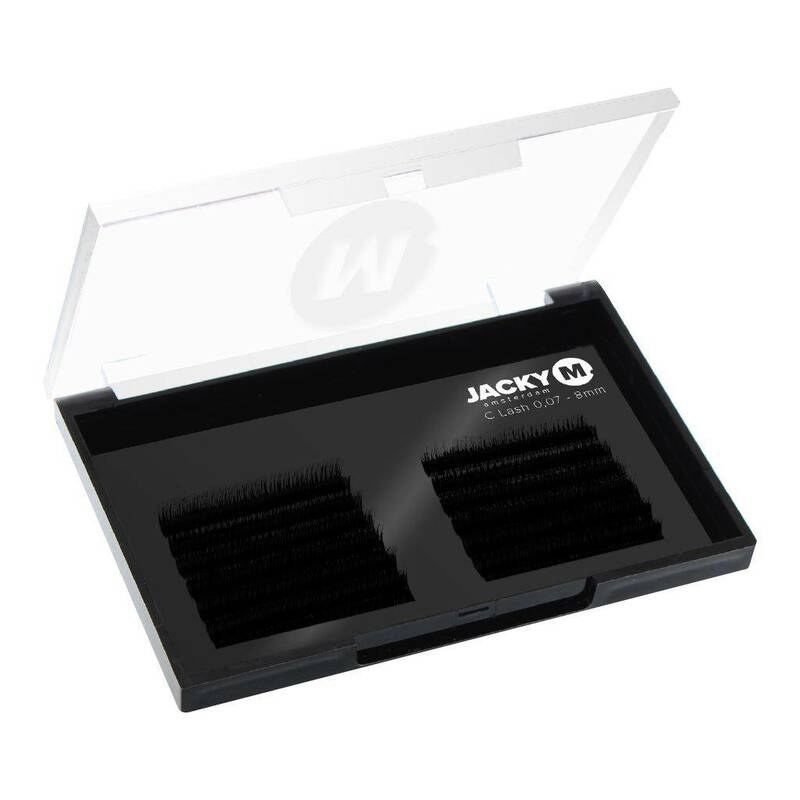 For a detailed explanation of the JACKY M. One by One or Russian Volume treatment we recommend to follow a JACKY M. Lash Treatment training.